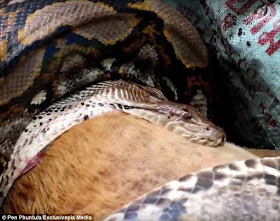 A distraught owner in Thailand got the shock of her life when she awoke to find her beloved pet head first in the jaws of an enormous python. 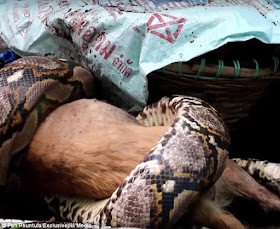 Klomphan Khiewwan, who lives in the central Thai provice of Pathum Thani, came downstairs at 3am to discover her pooch wrapped in its coils and half eaten by the 6 metre long snake. 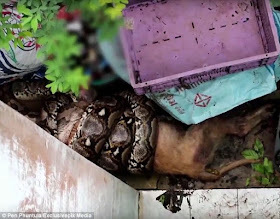 She called for help from volunteer rescue service the Ruamkatanyu Foundation, who arrived at the home with snake-catching equipment. 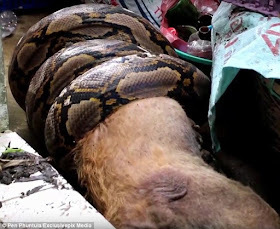 Unfortunately it was too late for poor Fino who died in the python's unyielding grip.